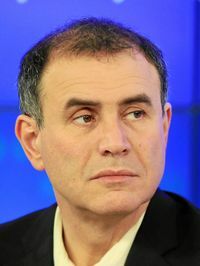 Nouriel Roubini is a professor of Economics at the Stern School of Business at New York University and an economic consultant who has been nicknamed "Dr. Doom" because of his dire economic predictions. He is also the co-founder and chairman of the firm Roubini Global Economics. He is widely credited with predicting the popping of the U.S. housing bubble and resultant economic collapse that began in 2007. Roubini has advocated nationalizing U.S. banks, saying that most of them are insolvent. He has also called for an overhaul of the international bank regulatory framework. To read the full article on Nouriel Roubini, click on to open a new tab with MarketsWiki. Roubini has long been an outspoken critic of cryptocurrency and blockchain technology, as well as notable figures in the crypto and blockchain space. In October 2018, Roubini called cryptocurrency "the mother or father of all scams and bubbles" while testifying at a congressional hearing on Capitol Hill. He said that everyone he knew that was actively involved in cryptocurrency trading was "financially illiterate," and "could not tell the difference between stocks and bonds." The same month, Roubini accused Vitalik Buterin and Ethereum co-founder Joseph Lubin of instigating "the criminal pre-mining sale/scam that created Ether" over Twitter. He said the two "stole 75 percent of the Ether supply and became instant 'billionaires' of fake wealth." Buterin responded over Twitter by saying he "never personally held more than 0.9 percent of all ETH" in circulation, and that his net worth "never came close to $1 billion." He also said that there are "no criminal laws against pre-mining." A story published by Forbes in February 2018 estimated Buterin's net worth at $400-$500 million. Roubini has even commented on the use of the word "sh*tcoin," saying that referring to fraudulent or useless cryptocurrencies in such a way constituted "a grave insult to manure that is a most useful, precious and productive good as a fertilizer in agriculture" during testimony before the U.S. Senate Committee on Banking, Housing and Urban Affairs On October 11, 2018 (the written text of the testimony provided by Nouriel does not use an asterisk). In December 2018, Roubini appeared in Coindesk's number one "Most Influential in Blockchain 2018." The list included ten other figures related to the crypto and blockchain space, including Changpeng Zhao, Elizabeth Stark, and Jed McCaleb. At the Deconomy 2019 conference in South Korea, Roubini participated in a debate with Vitalik Buterin about the value of digital assets. Some highlights from the debate include Roubini saying that the anonymity of crypto will not last, that any government "that wants to take over your wealth" will find a way to tax and register those with cryptocurrency, and that centralization of miners is "becoming oligarchical." Although the Deconomy crowd frequently booed Roubini, he remained firm in his stances. Doctor of Philosophy, Harvard University, Economics Department May 1988. Laurea in Economia Politica Universita Luigi Bocconi, 1982. ↑ Bitcoin is the 'mother of all scams' and blockchain is most hyped tech ever, Roubini tells Congress. CNBC. ↑ Ether Creator Claims He's No Billionaire in Twitter Crypto Fight. Bloomberg. ↑ The Richest People In Cryptocurrency. Forbes. ↑ Testimony for the Hearing of the US Senate Committee on Banking, Housing and Community Affairs On “Exploring the Cryptocurrency and Blockchain Ecosystem”. U.S. Senate Committee on Banking, Housing and Urban Affairs. ↑ Crypto’s King Midas: Backstage With CZ, the CEO Who Can’t Be Stopped. Coindesk. ↑ CoinDesk's Most Influential 2018. Coindesk. ↑ Vitalik takes on Roubini in Seoul to defend crypto’s offer of anonymity and social change. The Block. ↑ Nouriel Roubini. Roubini Global Economics.